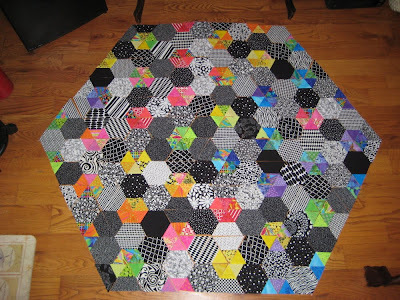 have you seen what people are coming up with for the hexagon quilt a long?? 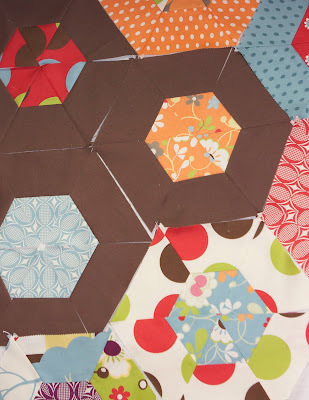 lots and lots of hexagons..
in all different colors... patterns... and so on! click on the photos to go to their blog & read about their progress! all we have left is the finishing directions..
and they will be posted in a day or two! Oh, just look at what you have started! Aren't they all beautiful? 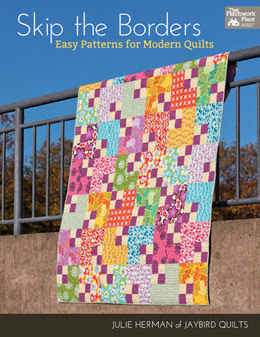 Everyone used gorgeous fabrics! Wow! Some stunning fabric choices! I really love seeing this variety of colors people put together and the different arrangements being tried out. I wish I were further along with my project, but I can't decide which arrangement to go with. My favorite block is #5, but I really need to catch up! 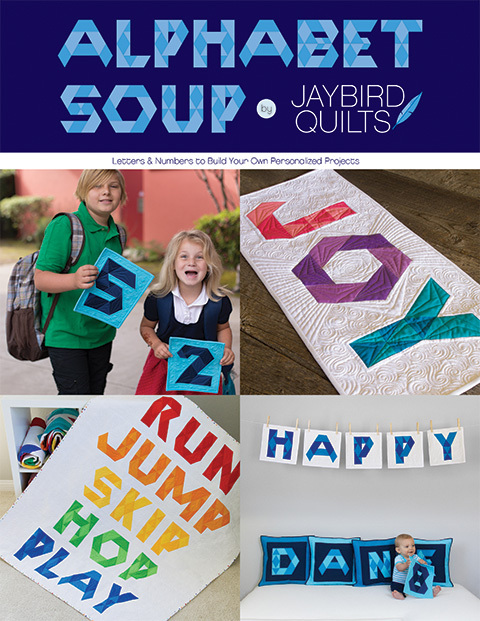 these are awesome Julie! 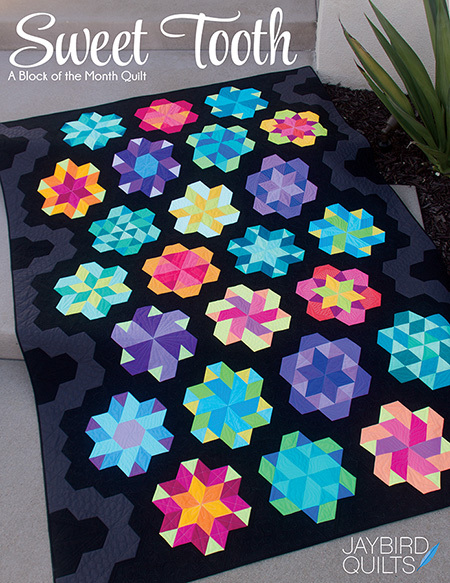 It's cool to see what people are creating from your quilt-along. Very cool. so many...so pretty!!!! i love all the different styles and color combination's!!! Love all these, I missed seeing a few of these in the flickr pool. Thanks for the link up! Absolutely gorgeous and non alike. 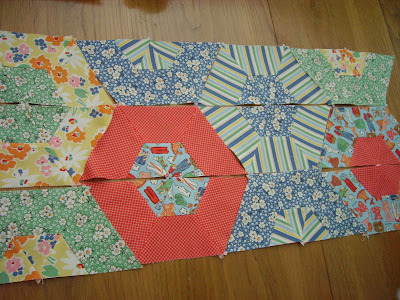 I finally got my 60 degrees ruler, so I better get some projects finished, so I can start on this one! Thanks for putting them all together Julie. 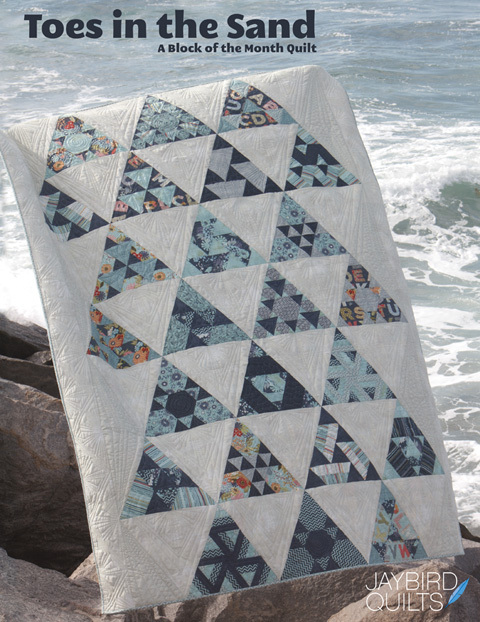 I love seeing all the pretty fabrics everyone is putting together. 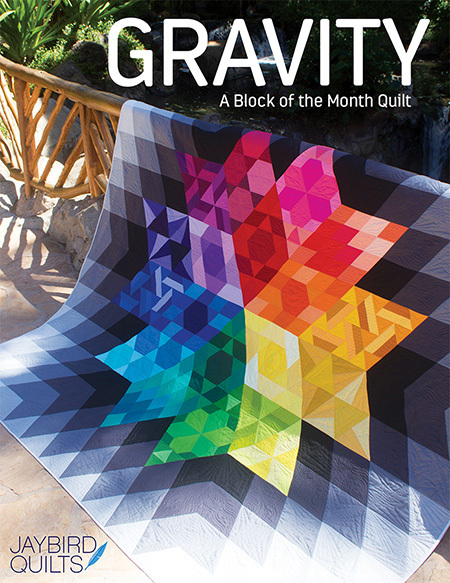 Thanks for featuring my blocks! 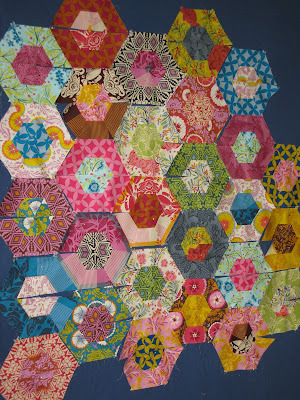 I loved this quilt along and can't wait to make another hexagon quilt! WOW! They are all wonderful! WOWSERS! What awesome eyecandy! I'm working on mine as well. Thanks for all the inspiration, Julie!! Wow. WOW!! that's all I can say. Beautiful. 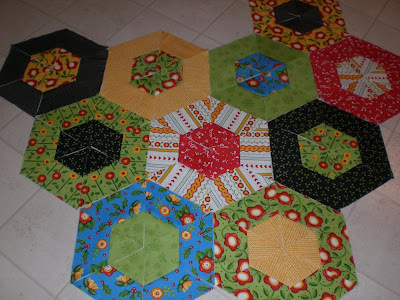 how cool is that big hexagon layout? I need to catch up on mine! They are all so fun and unique!What a great idea Julie... now, why haven't I posted mine on flikr? oooh!! so fun! I better get busy.... :) ciao...off to go sew! all the variations are amazing! WOW thanks for posting these!!! That just makes you want to use everyone's fabric!! Only a few more days! Oopsy, I need to get caught up. 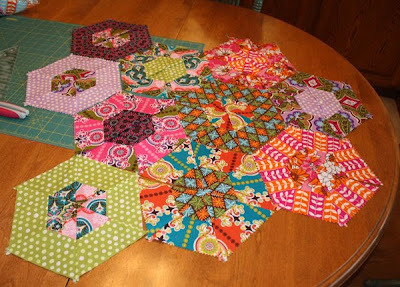 I've been admiring everyone elses but I guess this weekend I need to give some love to my own neglected hexies! Great job everyone! Thanks so much for putting them all together on your post! And including mine... 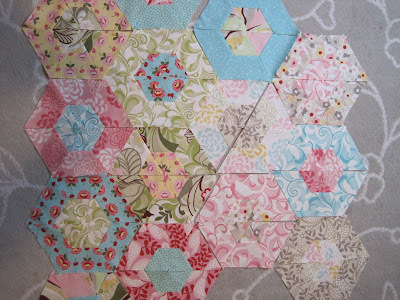 It's just amazing how different, but always stunning & beautiful the Hexagons look! 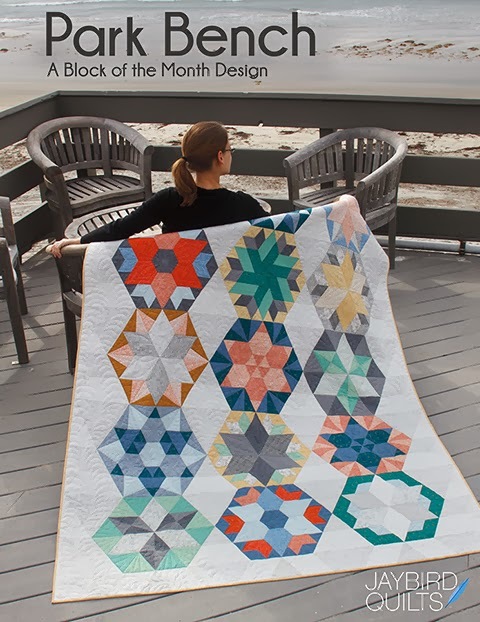 Thanks for initiating & organizing this Hexagon Quilt along - I always have said I'll never do a Hexi quilt (thinking of the tiny handstitched ones), but this is FUN! Even if you have challenges in the creative / designing department ( yep, an engineer is talking here...), it always turns out right! oh, these are so fun!! is it possible to still do this or am i just totally toooooo late? Wow this looks like fun, I'll have to get in involved in the next one. Its really fun to see everyone's progress! All of them are lovely! 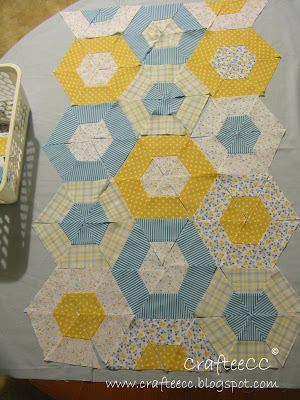 It is amazing how the different fabrics make for varied hexagons. What fun to see everyone's creativity with these blocks...great work everyon! Now a question. 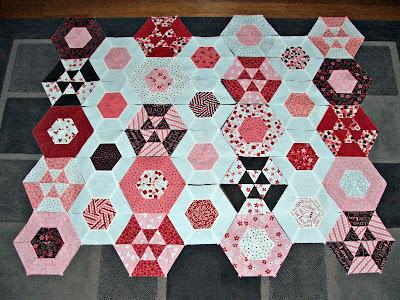 Does anyone know how to figure out what size the finished hexagon quilt will be? I'm not sure how many blocks I need. It probably is different with the different settings...right? Help?